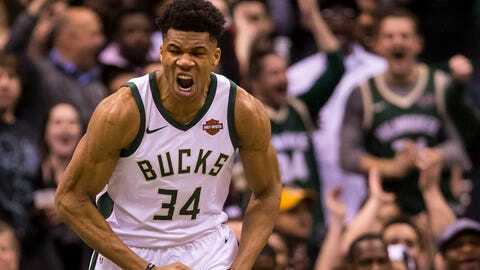 The Milwaukee Bucks will christen their new arena, Fiserv Forum, in the regular season on Friday, Oct. 19 against Indiana, two days after the team opens on the road at Charlotte. The league announced the 2018-19 regular-season schedule Friday. The Bucks’ longest homestand is six games, from Nov. 14-24, and includes the first appearance of Jabari Parker in a Chicago Bulls uniform on Friday, Nov. 16. Other key home dates include the first appearance of Kawhi Leonard on Toronto on Monday, Oct. 29, the champion Golden State Warriors on Friday, Dec. 7, the lone appearance of last year’s playoff opponent, Boston, on Thursday, Feb. 21 and LeBron James’ Los Angeles Lakers on Tuesday, March 19. Milwaukee will finish up the season with a three games at Fiserv Forum from April 6-10 against Brooklyn, Atlanta and Oklahoma City. The Bucks have two five-game road trips — Jan. 27-Feb. 4 and Feb. 24-March 4. As previously announced, the Bucks will play at the New York Knicks on Christmas Day. In addition, Milwaukee will host Dallas on Martin Luther King Jr. Day (Monday, Jan. 21) in a 1 p.m. contest. The Bucks will play games on back-to-back nights nine times. FOX Sports Wisconsin’s televised schedule will be announced at a later date. You can view the Bucks’ complete regular-season schedule here or here (PDF).